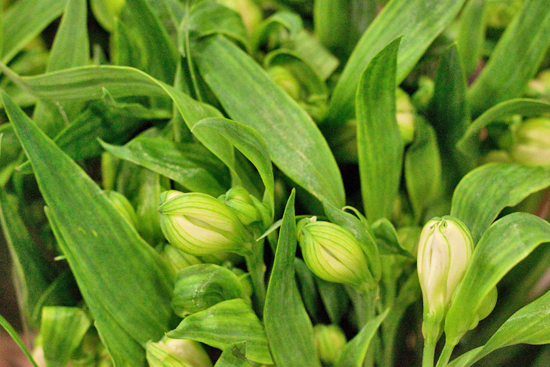 One of the most popular wholesale cut flowers available today, the Alstroemeria is celebrated for its long-lasting, beautifully marked flowers. 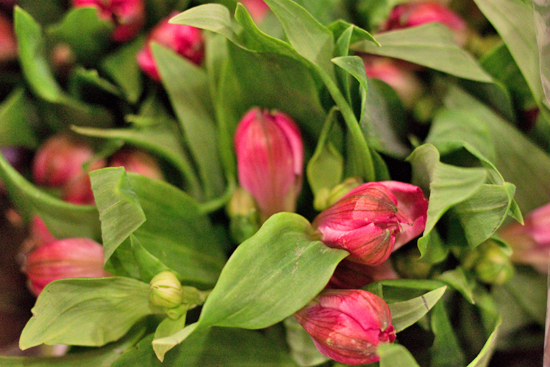 And in this month's Product Profile, we're going to take a closer look at this well-known bloom. 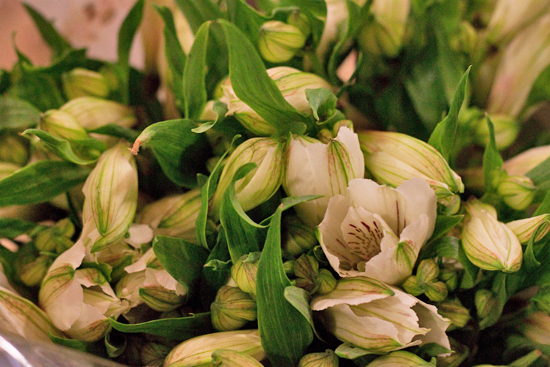 From the Alstroemeriaceae family, the Alstroemeria was named by the famous botanist Carl Linnaeus, after one of his pupils, Claus von Alstroemer, who sent him the seeds in 1753. 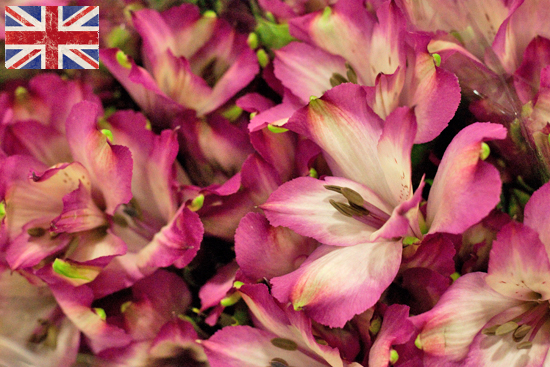 Commonly called the Peruvian Lily, although they're not lilies at all, Alstroemeria have trumpet-like flowers, which are gathered together in groups of four or five at the top of long stems. They come in a wide range of colours from soft pastels to dark and bright hues to bi-colours. You'll find white, orange, yellow, red, pink and purple varieties. The inner petals have distinctive black or dark brown spots or stripes. 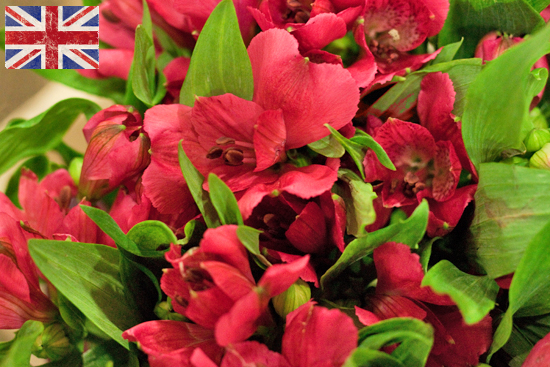 Originally from South America, they're available all year round and they have a great vase life of generally 7-14 days. 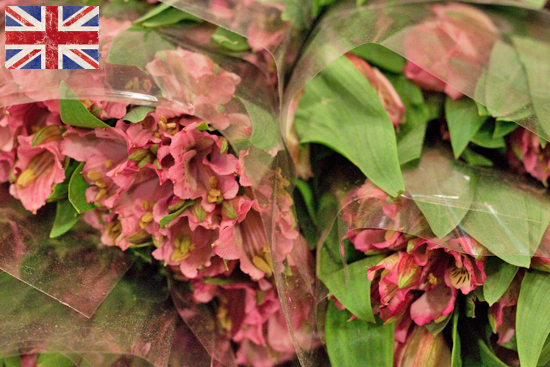 There are two main types of this wonderful bloom at Nine Elms…Standard and X-treme. 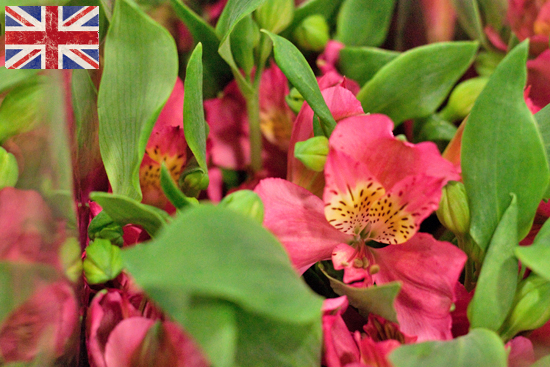 Many of the Alstroemeria at the Market come from British growers, some of whom are located in Cambridgeshire and Sussex. 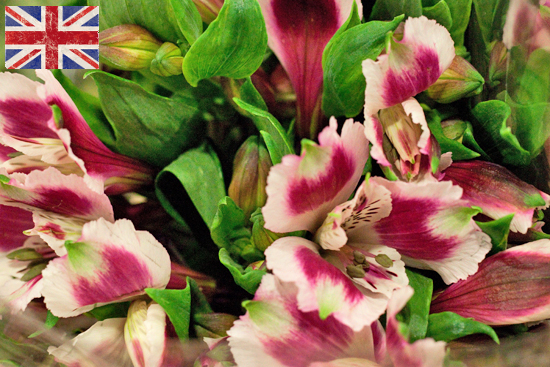 Zest Flowers stock a wide range of British Alstroemeria in many colours and they're generally available on their stand from March to November. 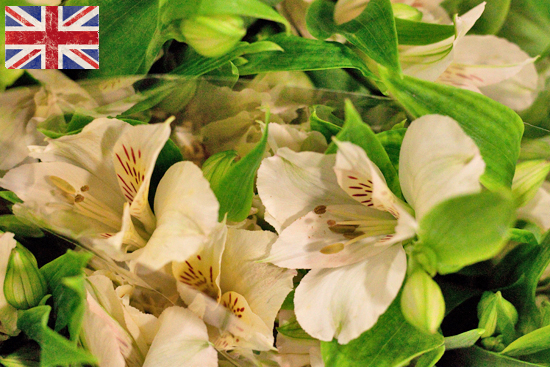 These British Alstroemeria below, sold in boxes, are available from Pratley... usually all year round. 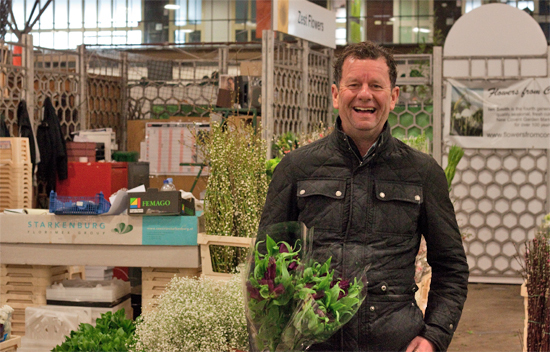 A Goodchild are another wholesaler who also sell home-grown Alstro in boxes. 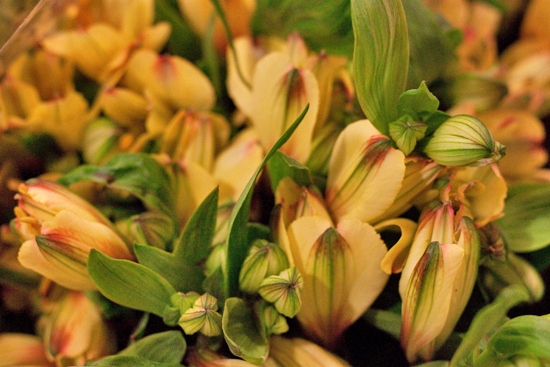 Alstroemeria X-treme is a relative newcomer to the floral world. 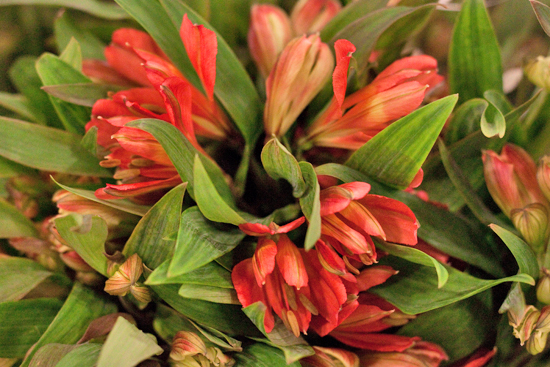 It has a totally different shape of flower head to other Alstroemeria varieties. Its flowers are greenish-white with a delicate touch of pink and you'll find about twenty extremely long-lasting blooms per stem. This variety is available at Zest Flowers. The secret of its long vase life of 2-3 weeks lies in the way it's cultivated. The grower does not harvest the flowers until they've reached maturity. This is contrary to the normal practice with the more common cultivars. Harvesting when mature increases their vase life. Generally speaking, this procedure would lead to problems with processing and transport. 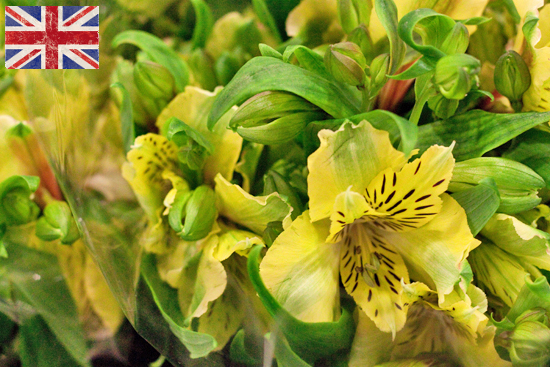 However, the unusual spray structure of Alstroemeria X-treme means that it's not sensitive to damage. 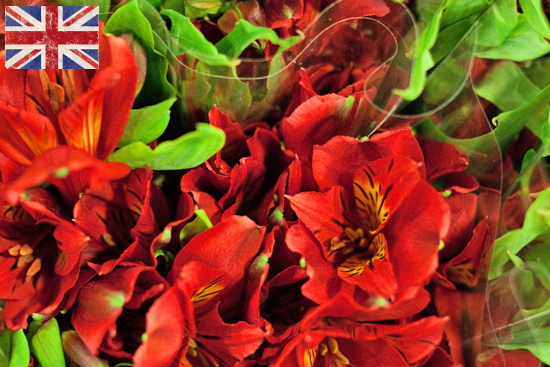 Alstroemeria from Holland, and sometimes Colombia, are also available at the Market. This white variety below is at Bloomfield. And these different varieties at Dennis Edwards Flowers. 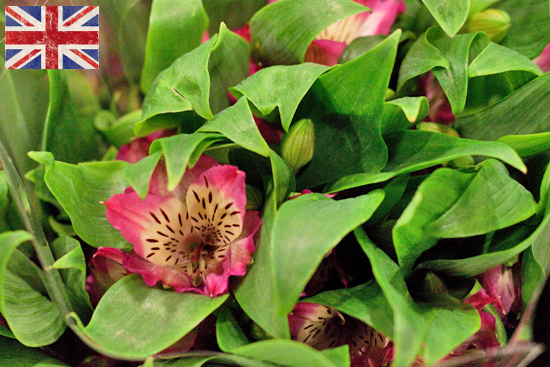 The British Alstroemeria at Zest Flowers come in bunches of 5 stems. Whilst at Pratley and A Goodchild, they come in boxes. 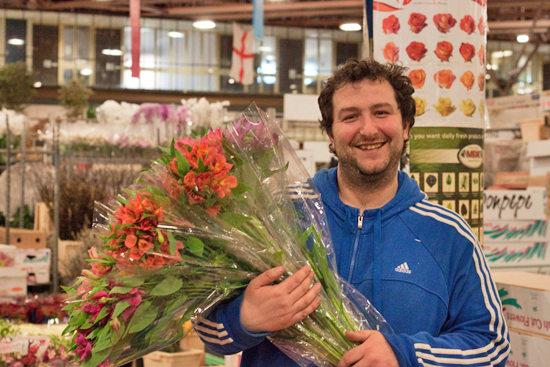 The Dutch varieties sold at the Market, by traders including Bloomfield and Dennis Edwards Flowers, are sold in bunches of 10 stems. Ronny at Bloomfield also said that people tend to ask for a particular colour. They may ask for an orange one or be specific and ask for a soft or strong orange, light or dark pink. 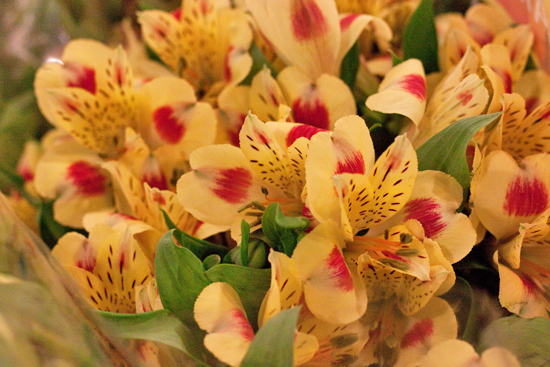 He said that Alstroemeria are a good 'utility' flower. Their leaves damage very easily, so handle them with care and do not stack flowers. Remove the majority of the leaves from the stem to encourage water to go to the flower heads. Cut the stems on a slant with scissors and place them in a clean vase with fresh water. You may notice that the leaves start to wilt and turn yellow before the flowers have finished blooming. So, simply take off the leaves that have discoloured and re-cut the stems. When the individual flowers do start to fade, remove them, leaving the remaining buds to open. 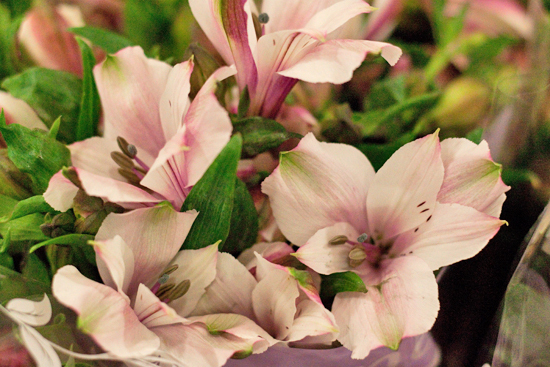 Alstroemeria are known to cause allergic reactions on the skin of some people. This can be avoided by wearing latex gloves when handling the flowers. 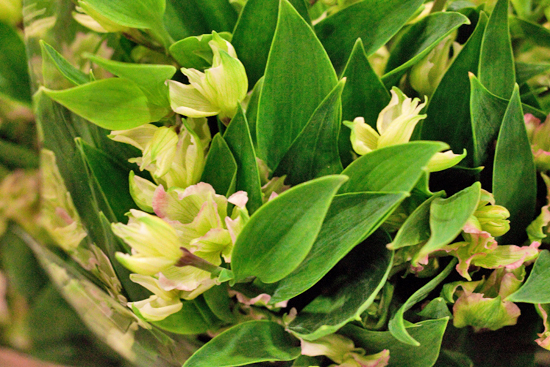 Alstroemeria are perfect to use in bouquets and arrangements, combined with other flowers and foliage. 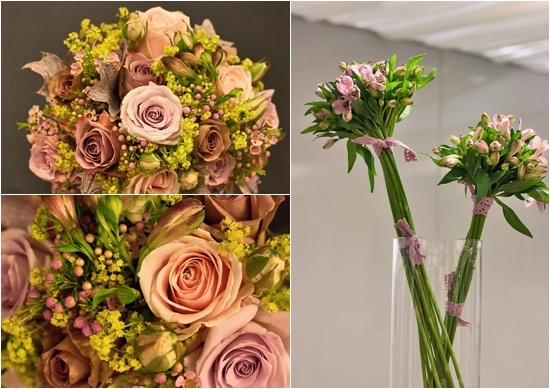 Here's an example on the left below…a vintage style bridal bouquet, where semi-open blooms have been used. They also look fabulous grouped on their own to create a monochromatic arrangement. On the right is a 'lollipop' design, made by Hannah from Jane Packer at the Country Living Magazine Spring Fair last year. She used pink lace to secure the stems, but you could also use ribbon or seagrass cord. 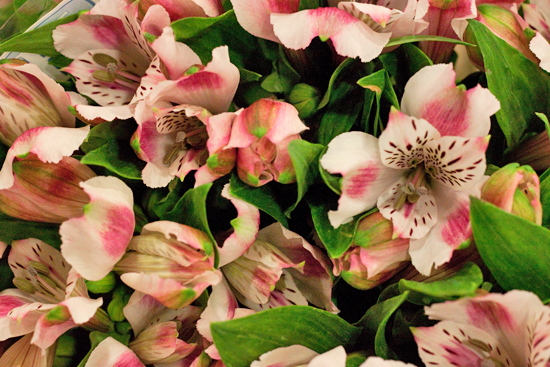 How do you feel about Alstroemeria? Please do let us know by simply filling in the boxes below. And also let us know if you have any questions or would like to make any general comments. We'd love to hear from you!